It’s (Inter)National Scrapbooking Weekend! YAY! I love any reason to scrapbook, and this is a great reason to get yourself into your craft space! The Cut Shoppe has a couple of exciting things happening today (and all weekend long!) First, there is a 50% discount for the entire weekend! 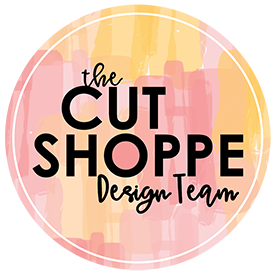 Second, there is a freebie cut file that you can download straight from The Cut Shoppe Blog. Today I have a layout to share that I created a layout using the freebie cut file, Happy Now. I started with a white cardstock base and added a splash of color to the background using two different colors, No Yoking Coloringz & Mandarin Mai Tai Coloringz, from Shimmerz Paints. I chose a bright and colorful patterned paper from the Amy Tangerine Finders Keepers Collection for the cut file image. I then grabbed ephemera pieces from multiple Amy Tangerine Collections including Yes, Please and many other collections that I’ve been hoarding in my stash! I created clusters in three different areas on the cut file. I kept one of the clusters open for my journaling which I typed on my We R Memory Keepers Typecast Typewriter. I cut the journaling into small strips, similar to tiny word stickers, and added them to the journaling spot. I backed the word “Hello” with black cardstock so I could incorporate it as part of my title, and I used Amy Tangerine black Thickers for the remaining words of the title. I then added my photo to the last open spot on the cut file. It’s a recent photo that I posted on Instagram from a field trip I attended with my kiddo. I’m always so grateful to be able to spend time with him during his school activities. For final touches I added a few Amy Tangerine enamel hearts and a border of black hand stitching around the perimeter of the circle cut file image. Thanks so much for joining me today & I hope you find some time to be creative this weekend!